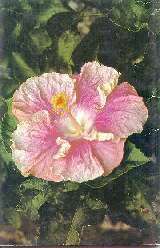 The following gives a clear idea of the fickleness of fate in the way hibiscus blooms hold tenure on the longevity of their popularity. Twenty years is a long time to test a cutivar in the arena and it is certain that only the best of these is still in circulation. 1. "Twilight Glow"      S. E. Beard. QLD. AUST. 2. "Shirley Howie"      S. E. Beard. QLD. AUST. 3. "Pink Radiance"      S. E. Beard. QLD. AUST. 4. "Wallace Keir"       Jim Howle         QLD. AUST. 5. "Sonia"              L. Beers. N.S.W. AUST. 6. "Surfie Jack"        S. E. Beard       QLD. AUST. 7. "Liberstraum"        S. E. Beard       QLD. AUST. 8. "Fairyland"          S. E. Beard       QLD. AUST. 9. "Lady Godiva"        S. E. Beard       QLD. AUST. 10. "Strawberry Sundae"  S. E. Beard       QLD. AUST. 11. "Noela Reaburn"      S. E. Beard       QLD. AUST. 12. "Pretty Baby"        S. E.  Beard      QLD. AUST. 13. "Summer Samba"       S. E. Beard       QLD. AUST. 14. "Stardust"           S. E.  Beard      QLD. AUST. 15. "Destiny"            S. E. Beard       QLD.AUST. 16. "Moulin Rouge"       S. E. Beard       QLD.AUST. 17. "Adorable"           S. E. Beard       QLD.AUST. 18. "Balalaika"          S .E. Beard       QLD. AUST. 20. "Aladdin"            S. E. Beard       QLD. AUST. "Daniel D. Wolfe"               "Nagao 20"
pleasure from them as I have done over the years. To my dear friends, Len and Adeline Quinn, Three Cheers! courtesy of their Publication Department. Society, Florida, U.S.A. for information on varieties. patient and understanding and giving her labour at no cost. The various people who have helped in any way, thank you.